New York, New York – The American Choice Awards (America’s Largest Consumer Vote) today announced the nationwide gluten-free food & lifestyle study with Gluten-Free Living. To help consumers interested in a gluten-free lifestyle, Gluten-Free Living readers provide important feedback and insights about key product categories such as Breakfast, Breads, Pasta, Baked Goods, Flour, Baking Mixes, Snacks, Crackers, Chips, Beverages, Personal Care and more. “Gluten-Free Living’s well-informed audience is uniquely qualified to educate consumers about these important topics.” said Renee Jones, American Choice Awards Vice President of Polling and Research. Best Brand Award Winners will appear in special Feature Sections within Gluten-Free Living, and official winner announcements via social and mass media outlets throughout 2018. For more than two decades Gluten-Free Living has been the go-to resource for consumers interested in the gluten-free lifestyle. “We extend a big thanks to the American Choice Awards for shining a national spotlight on solutions that can help millions of families suffering from food allergies. We look forward to helping the winning brands connect with new fans everywhere,” said Gluten-Free Living founder Ann Whelan. The American Choice Awards gives consumers a voice across more than 200 product categories. National Best Brand Award Winners and Nominees include Starbucks, Crest, Campbell’s, Nestlé, Viking, KitchenAid, L’Oréal and leading smaller brands. The ACAs are 100% consumer-voted, and all Nominees have an equal opportunity to win. Today’s consumers are overwhelmed with options, and they rely on reviews and recommendations more than ever before. The Best Brand Awards empower shoppers to cut through the clutter and instantly recognize The Choice of American Consumers®. Nationwide consumer research is conducted using the M-CAP (Multimedia Consumer Aggregation Platform) and the proprietary balloting system developed with experts at The National Opinion Research Center at The University of Chicago. The NORC AmeriSpeak® OMNIBUS Research is the most scientifically rigorous statistical survey of consumers in the U.S. Consumers score category-specific criteria as well as important factors of Quality, Value, Sustainability and Recommendation Likelihood, a combination unique to the American Choice Awards research process. Finalists receive a numerical grade for each criterion, and award-eligible winners are determined by the greatest number of total points earned. “The data are weighted so that the results are representative of the entire U.S. population of Primary Shoppers. The Best Brand Award process is the most comprehensive methodology of its kind”, said Jen Johansen, American Choice Awards Senior Vice President of Polling and Research. 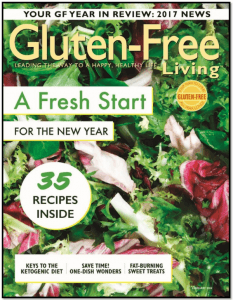 As the authoritative voice in the market since 1995, Gluten-Free Living provides trusted and reliable information to inspire readers to live their most fulfilling gluten-free lifestyle. Gluten-Free Living’s comprehensive reporting delivers key information about ingredients, labeling, nutrition, medical research, healthy recipes and more. Experienced Editors use their first-hand knowledge of the gluten-free diet to share solutions for the very best in gluten-free living. For additional information and subscriptions, please visit www.GlutenFreeLiving.com. The American Choice Awards brings together foremost research, influential media and consumers nationwide to determine America’s favorite brands. The National Best Brand Seal empowers consumers to save time and make better choices for themselves and their families. You will find Best Brand Winner Announcements on TV, and in Special Feature Sections in leading publications and websites. American Choice Awards voting, operations and studios are located in New York, NY and Orlando, FL. For additional information, please visit www.AmericanChoiceAwards.com.